Through the financial support of faithful US donors, Family Health Ministries is able to provide Bibles to people in the Port-au-Prince area. The Bibles are distributed by FHM partner Pastor Leon Dorleans in the Christian Community Churches of Cite Soleil, Blanchard, and Repatriote. Pastor Leon credits the Bible distribution program for increasing attendance at worship services. Since the inception of the program in 2002, thousands of Bibles have been distributed. 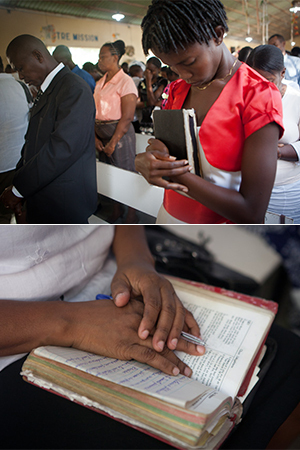 In Haiti, a Bible is an extremely valuable possession. When the average monthly income for a Haitian family is $30, it is extremely difficult to afford the purchase of a $10 Bible. Haitians place great value on being able to own their own personal Bible. Most Haitians carry their Bible with them everyday. The ability to carry the word of God with you, open it up, and read and share with your family is priceless. A personal Bible has the ability to bring a family together in so many way. Often, children that can read will try to teach their parents to read through the Bible.